5 DVDs · 8 hrs. 30 mins. Perfect for the CAT-ASVAB, SS ASVAB, AFCT, and more! A crucial test stands between you and a career in the military: the Armed Services Vocational Aptitude Battery. 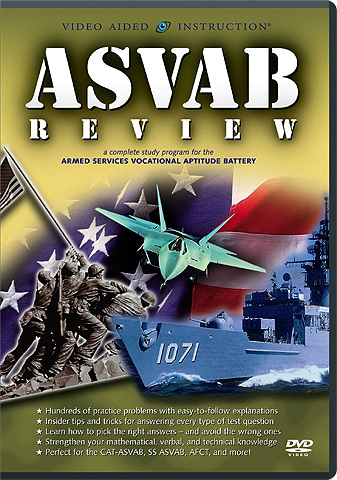 A daunting challenge for many aspiring military personnel, the ASVAB is used not only as a screening tool, but as a career placement guide — which makes getting a good score even more important. All prospective military personnel should be sure to watch this user-friendly program. Don’t let the ASVAB intimidate you – this bestseller is your secret weapon for making the military! Copyright ©2004 Video Aided Instruction, Inc. All Rights Reserved.